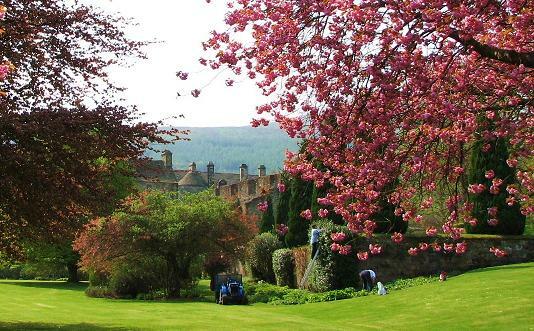 This historic Falkland Palace is set in beautiful gardens in the centre of the pretty village of Falkland. 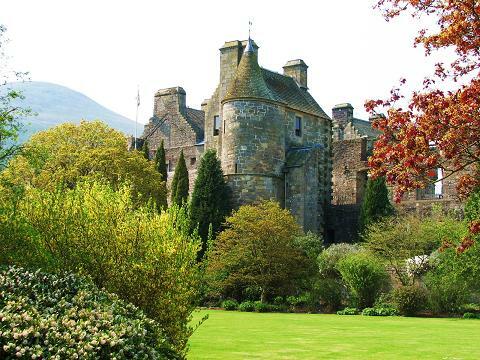 Falkland Palace and Gardens is one of our favourite places in Scotland. There are a profusion of flowering shrubs and trees in the Spring and the adjoining orchard is full of apple blossom - just ideal for a picnic. Formal borders give good displays of flowers in the summer and last well into the Autumn. There is a peaceful pool garden where you can sit and take in the magnificent scenery. Adjacent is the historic Royal Tennis Court built in 1539 which is open. Watch the swallows which nest each year on the supporting columns of the visitors gallery. The palace itself is wonderful and one of the most interesting historic buildings I have visited - Editor! An enchanting place. Also take time to look around the lovely village. 2019 NTS. Falkland Palace and Garden: From 1 March. Disabled access to Gardens but not Palace. Shop. Nearby tearooms. If you want to take a break near Falkland Palace and Garden, why not stay in one of our recommended hotels. Each hotel has genuine guest reviews enabling you to book from anywhere in the world in total confidence. Look now - click here.